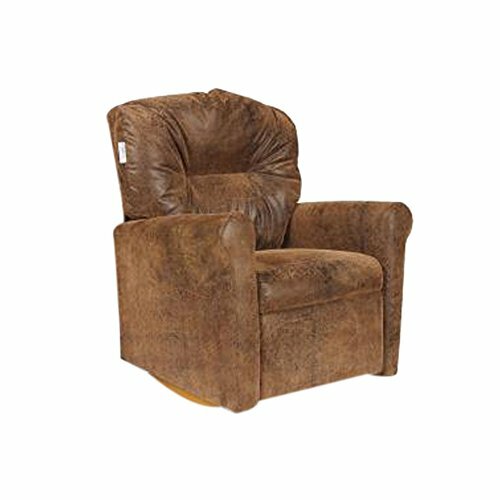 This Contemporary Brown Bomber Child Rocker Recliner Chair will make a statement in any room. It is perfectly suited for the perfect child. This high-quality recliner comes in a kid-durable, velvety soft upholstery which makes cleaning up crumbled cookie crumbs a snap. You'll be "the bomb" with the Brown Bomber Rocker Recliner. Bring it home today. Add a little rock to your little one's favorite afternoon show.Exclusive safety design keeps rocker from rocking or tipping over while in the reclined position. Dimensions: 27" highx 24" deepx 24" wide. Weight of Chair 30 lbs.